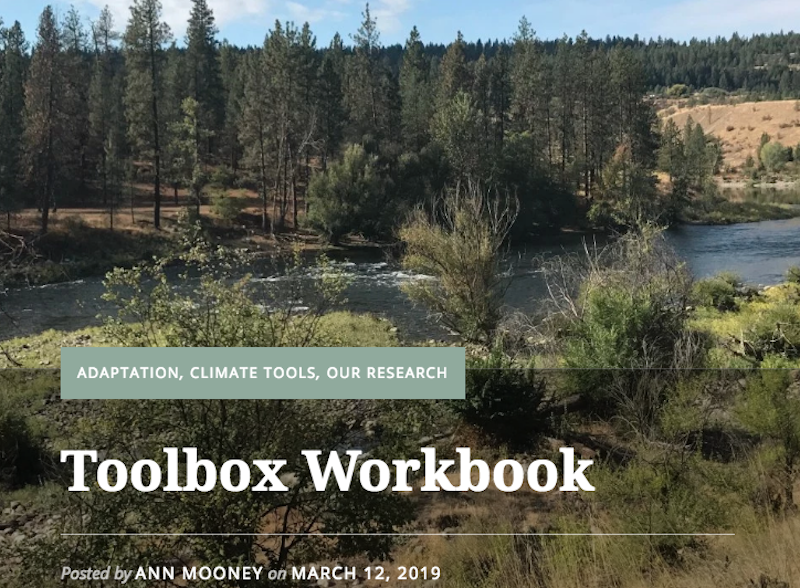 In the March 2019 Climate Currents for the CIRCulator, Ann Mooney describes how the workbook for the Northwest Climate Toolbox Workbook was created and what it has to offer for you in the way of guidance in using the Northwest Climate Toolbox and in creating climate data stories. 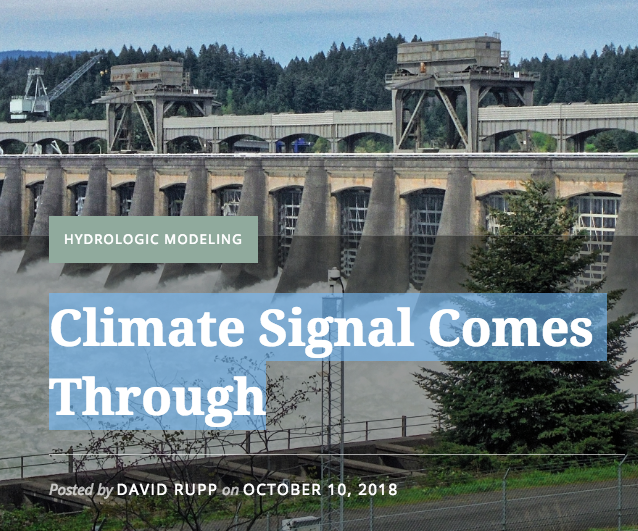 In the October 2018 Climate Currents for the CIRCulator, David Rupp shows that the "Climate Signal Comes Through". He highlights a recently published article by David Finklin, John Abatzoglou and others which demonstrates that streamflow trends and patterns are similar regardless whether a site is attached to a natural or modified stream or river. 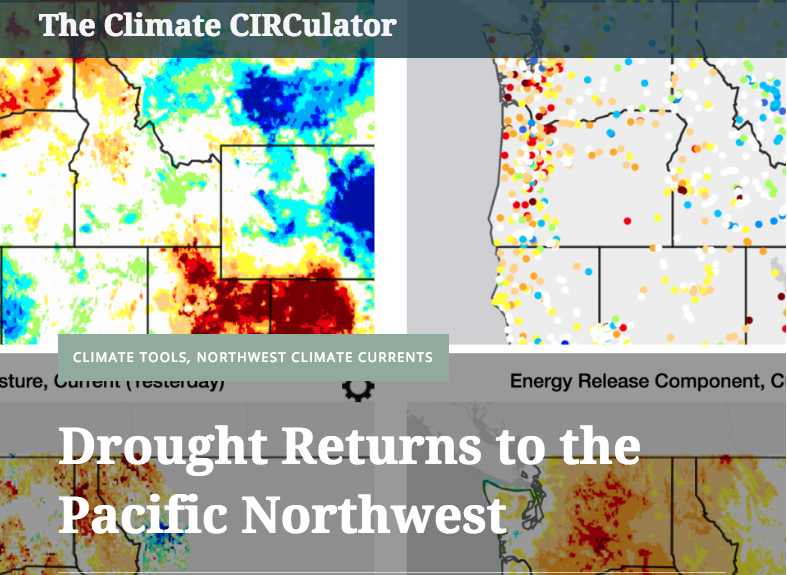 In the August 2018 Climate Currents for the CIRCulator, John Abatzoglou shows that "Drought is back in the Pacific Northwest". He explains that there are many forms of drought and uses a new tool, the U.S. Water Watcher, to show current drought conditions in some of the different forms (or flavors). From the US Water Watcher, he shows a panel of four maps of current precipitation, streamflow, soil moisture and the energy release component to look at meteorological, hydrological, agricultural and ecological drought, respectively. He also looks at current dry vegetation conditions over the Pacific Northwest and where current fires are with maps from the NW Climate Toolbox's 'Climate Mapper' tool. 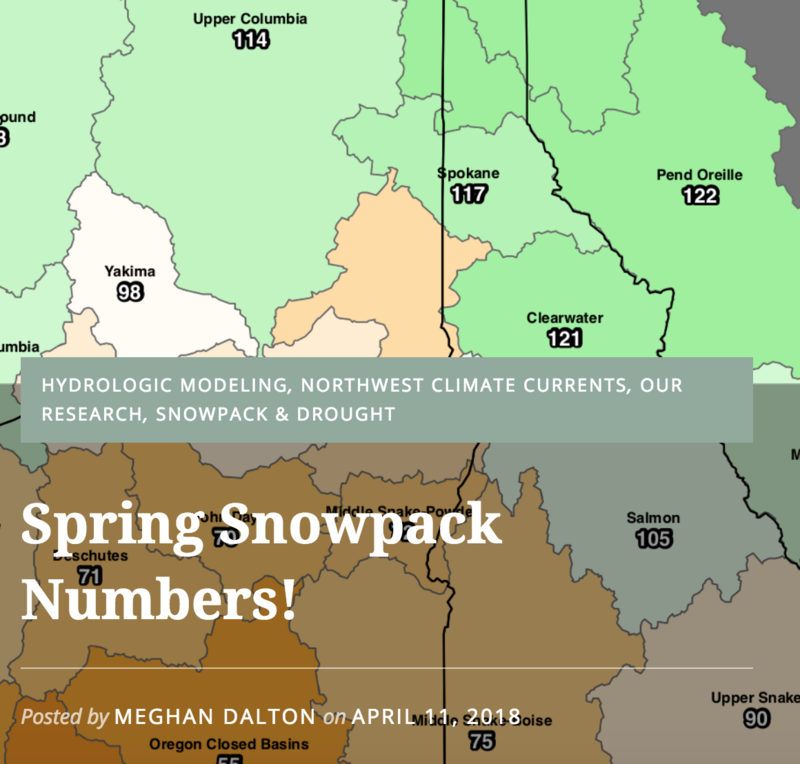 In the April 2018 Climate Currents for the CIRCulator, Meghan Dalton shows the "Spring Snowpack Numbers" as the current state of the snowpack in the Pacific Northwest(PNW) is still a story of haves and have-nots. She explains how Washington, northern Idaho, and western Montana have above normal snow numbers, while much of Oregon is below normal, with Southern Oregon in a snow drought. She shows a map of temperature and precipitation anomalies from the NW Climate Toolbox's 'Climate Mapper' tool and a map of current Snow Water Equivalent(SWE) from the Natural Resources Conservation Service’s interactive map tool to explain the current snowpack conditions over the PNW. 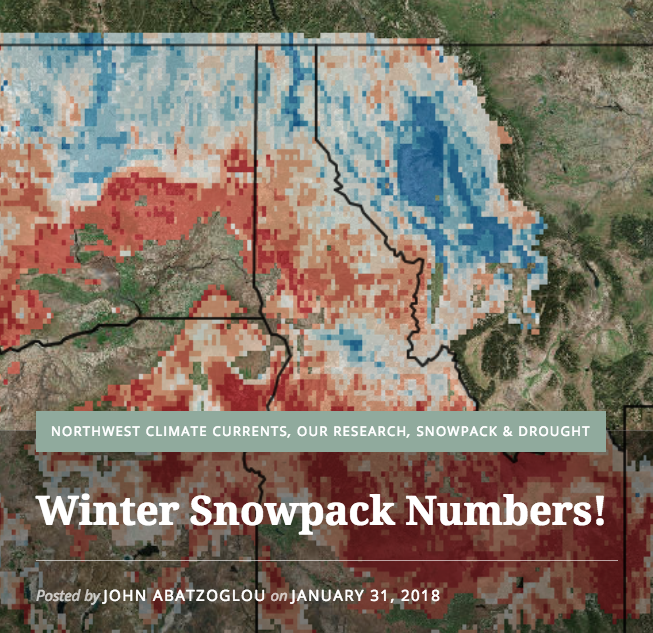 In the January 2018 Climate Currents for the CIRCulator, John Abatzoglou shows the "Winter Snowpack Numbers" as the current deficient state of the snowpack in the Pacific Northwest(PNW), explains how this came about and how there is still room for optimism if the current La Nina can deliver snow late in the winter season. He shows a map of the Snow Water Equivalent (SWE) from the NW Climate Toolbox's 'Climate Mapper' tool to explain the current snowpack deficiency over the PNW. 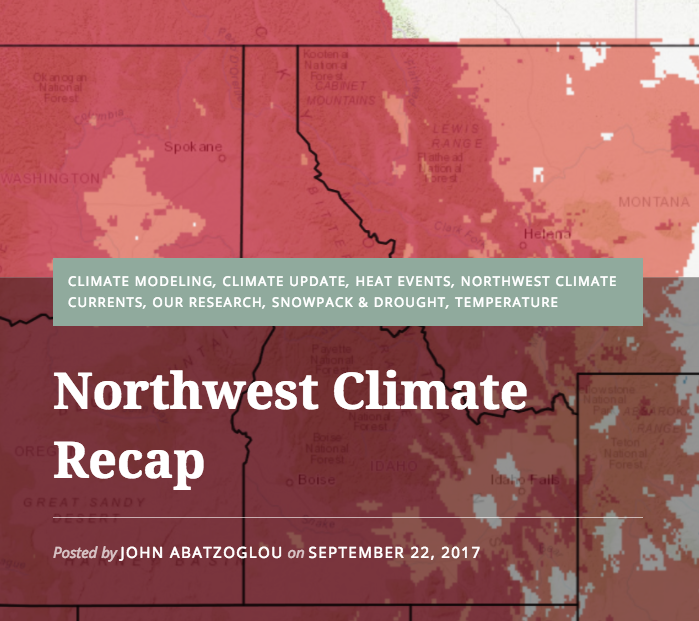 In the September 2017 Climate Currents for the CIRCulator, John Abatzoglou gives a 'Northwest Climate Recap' of the record breaking cold winter of 2016-2017 and the warm, dry and fiery summer of 2017. He shows a visualization of temperature percentiles from the NW Climate Toolbox's 'Climate Mapper' tool to explain these broken records. 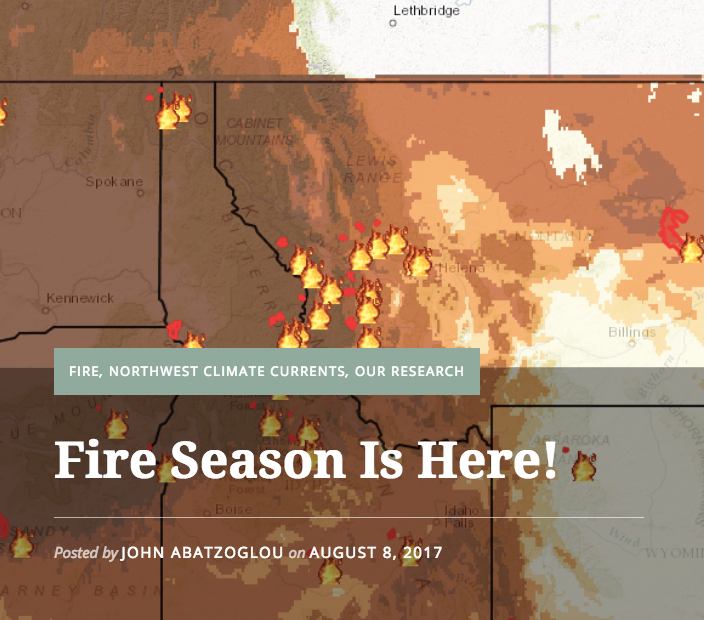 In the August 2017 Climate Currents for the CIRCulator, John Abatzoglou excites 'Fire Season is Here' and explains the climate conditions that led the Pacific Northwest(PNW) to be engulfed in fire in August 2017. He shows a map of the Energy Release Component from the NW Climate Toolbox's 'Climate Mapper' tool to explain the current dryness of the vegetation over the PNW.